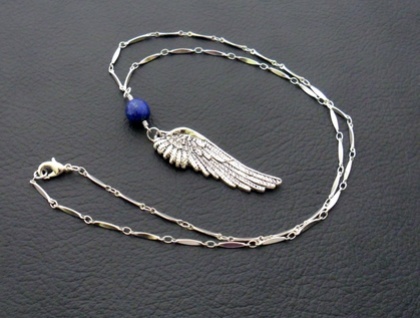 This necklace showcases royal blue lapis lazuli, flecked with grey and gold, above a highly detailed, antiqued-silver coloured angel-wing pendant. The chain is a silver plated, bar and ring chain. The necklace fastens with a high quality, silver plated lobster-claw clasp. The wing pendant is made of silver coloured alloy, and has been antiqued to show up its lifelike feather details. 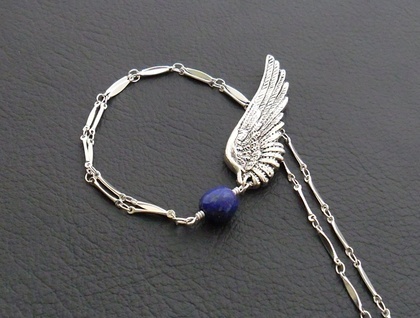 The lapis lazuli is wire-wrapped with non-tarnish, silver coloured artistic wire. It is an amazing, intense, deep royal blue. Lapis lazuli is one of my favourite stones. It is a distinctive, rich, midnight blue, usually speckled with pyrite (fool's gold) and calcite, like gold and white stars in a deep blue, dreamlike sky. The name 'lapis lazuli' comes from the Latin 'lapis', which means stone, and the Persian 'lazhward', the name of a place where lapis lazuli could be mined. Eventually, the word 'lazhward' came to be identified with the stone, and subsequently the colour of the stone. As a result, our English word 'azure' comes from 'lazhward'. The history of this stunning semiprecious stone is fascinating. For example, the ancient Egyptians, obsessed as they were with the afterlife, called lapis lazuli the 'stone of heaven', because it was blue, and decided that it was therefore more valuable even than gold. They also powdered it and used it as eyeshadow. ‘Celestial Wing’ is a one-off Silverlight Jewellery design that will never be repeated. This one of a kind necklace measures 56cm, including the lobster-claw clasp, while the angel wing measures 49mm lengthwise and 17mm across at the widest point. 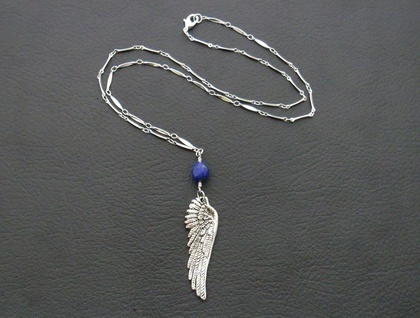 The pendant, from the wire-wrapping to the tip of the wing, measures 7.2cm. The chain on this necklace can be shortened, but not lengthened. Simply leave a message in the ‘notes for silverlight’ field that will appear when you check out of Felt, stating what length you would like the chain to be.